Although it has been well established that Flemish manuscript illumination of the sixteenth century was deeply entwined with the art of panel painting, most studies have heretofore largely considered individual artists or looked at the cross-over of particular instances of iconography. 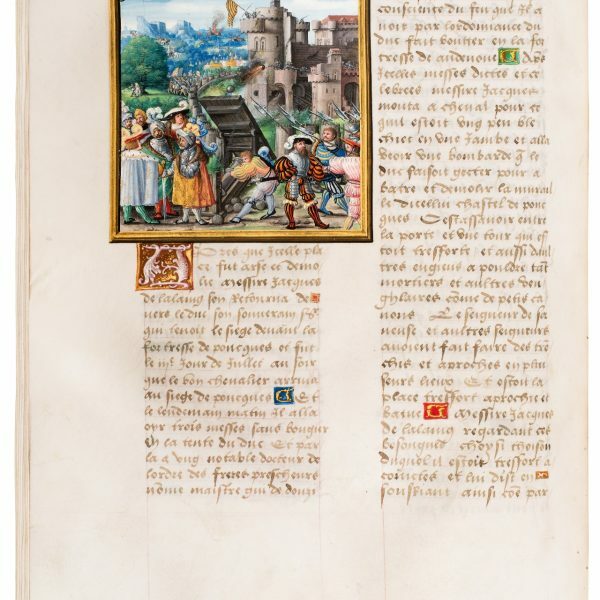 The recent acquisition by the J. Paul Getty Museum of a magnificent manuscript of the Livre des fais de Jacques de Lalaing opens new avenues of research into the concept of overall stylistic borrowings between the two media. The manuscript’s miniatures are the work of an unknown artist who was deeply influenced by the work of the so-called “Antwerp Mannerists” in terms of style and the integration of well-known tropes, but also artfully combined with established elements associated with vernacular manuscript painting of the period. This paper will consider how this artist, whose work has been identified in a handful of manuscripts, creates an innovative fusion between the arts of manuscript and panel painting, taking astute advantage of the possibilities offered by both. This entry was posted in seminar and tagged Antwerp Mannerists, Flemish, illumination, manuscripts on October 11, 2016 by mikechanters.